Official assessments radically underestimate the magnitude of warming experienced by city dwellers today. To live in a large city today is to be on the edge of the most rapidly changing environmental conditions ever experienced by humans. 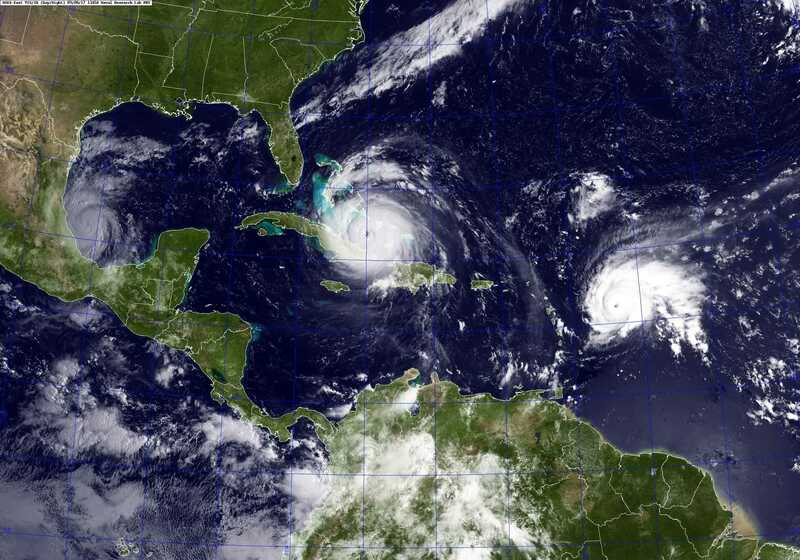 Hurricanes Irma, Jose and Katia 2017. via Wikimedia Commons. Milestones on the road toward climate chaos are all too frequent these days: in 2015, the Manua Loa Observatory in Hawaii reported that the daily mean concentration of CO2 in the atmosphere had surpassed 400 parts per million (ppm) for the first time; each year Arctic sea ice levels grow lower and lower; permafrost in areas like Siberia and Alaska is melting, releasing dangerous quantities of methane into the atmosphere; and each year brings more violent storms and more severe droughts to different parts of the world. Indeed, news of apocalyptic climate-related events is so manifold that it can feel overwhelming, producing a kind of disaster fatigue. One recent announcement merits particular attention, however: in the summer of 2014, a team of NASA scientists announced conclusive evidence that the retreat of ice in the Amundsen Sea sector of West Antarctica had become unstoppable. This melting alone, they concluded, will drive global sea levels up by over 1 meter (3 feet). As the Pine Island, Thwaites, and other glaciers of the Amundsen Sea sector collapse into the ocean, the effect is expected to be like a cork removed from a bottle of champagne: the ice the glaciers held back will rush rapidly into the sea, and the entire West Antarctic ice sheet will collapse. Sea levels will consequently rise 3 to 5 meters (10–16 feet). In addition, it was recently discovered that the same process that is driving this collapse, the intrusion of warmer ocean water beneath the glaciers in West Antarctica, is also eroding key glaciers in East Antarctica. The East Antarctic ice sheet contains even more ice than the western sheet: the Totten glacier alone would account for 7 meters (23 feet) of sea level rise. As if this weren’t bad enough news, a similar process of melting is also taking place in Greenland, where fjords that penetrate far inland are carrying warm water deep underneath the ice sheet. Shockingly, few orthodox scientific predictions of sea level rise have taken the disintegration of the Antarctic and Greenland ice sheets into consideration. The latest report by the Intergovernmental Panel on Climate Change (IPCC), for example, projects a high of three feet of sea level rise by 2100, but this prediction does not include a significant contribution from the West Antarctic ice sheet. Like the IPCC’s projection for Arctic sea ice collapse, which has moved up from 2100 to 2050 in the latest report, this prediction is clearly far too low. What explains such gross miscalculations? The protocols of scientific verifiability provide a partial explanation. The general public has urgently wanted to know, after city-wrecking hurricanes like Katrina and Sandy, whether the devastation was caused by climate change. But unfortunately scientists have until quite recently been unable to make direct links between particular extreme weather events and climate change in general. This, as environmental philosopher Dale Jamieson puts it in Reason in a Dark Time, would be like saying that a specific home run is “caused” by a baseball player’s batting average. If scientists are becoming less reticent to make these links, as the science of attribution grows more sophisticated and able to track the causes of weather extremes, the change is still occurring slowly. Nevertheless, the IPCC’s failure to account for the destruction of the Antarctic and Greenland ice sheets can only add to skepticism toward their predictions, especially after they were widely attacked for their 2007 calculations about the speed of Himalayan glacial melting. Further fueled by the climate change denial industry, the IPCC’s own excessively rosy predictions for the future will only increase skepticism. In their 2000 report, for example, the body assumes that nearly 60 percent of hoped-for emissions reductions will occur independently of explicit mitigation measures. As the urban theorist Mike Davis has pointed out, the IPCC’s mitigation targets assume that profits from fossil capitalism will be recycled into green technology rather than penthouse suites in soaring skyscrapers. The IPCC projects a market-driven evolution toward a post-carbon economy, a set of assumptions that, as spiraling levels of greenhouse gas emissions since 2000 demonstrate all too clearly, are dead wrong. These projections concerning sea level rise and the vulnerability of coastal cities will have to be radically revised, especially after spectacular urban disasters hammer home the inadequacy of current projections. But these world-changing transformations will not take place in the distant future. Citing evidence drawn from the last major ice melt during the Eemian period, an interglacial phase about 120,000 years ago that was less than 1ºC warmer than it is today, climatologist James Hansen predicts that, absent a sharp and enduring reduction in greenhouse gas emissions, global sea levels are “likely to increase several meters over a timescale of 50 to 150 years.” Should they prove accurate, Hansen’s forecasts spell an utter transformation of human habitation across the globe within one generation. The Intergovernmental Panel on Climate Change's conservative predictions are of a piece with one of the key ethical dilemmas of the Anthropocene Age, the era of human dominance over the planetary environment. Despite the increasingly destructive impacts of climate change around the planet, both cause and effect, and perpetrator and victim, are extremely difficult to pinpoint, either in time or space. Climate change is the ultimate form of slow violence. This has made it difficult to identify who should be responsible, and has led to political paralysis. As the philosopher Stephen Gardiner argues in A Perfect Moral Storm, three structural asymmetries create the present cul-de-sac. Around the globe, the hyperwealthy percent are engaged in a feckless, hedonistic binge to end all binges, their systematic consumption obliterating the prospects of the poor, nature, and future generations. While they loot the planet, the rich live in well-protected penthouses and suburban garrisons, assiduously averting their eyes from the global majority, the swiftly deteriorating natural world, and the future they are so heedlessly obliterating. At present there is no way for future generations to interrupt the orgies of the rich, no way for the natural world to assert its rights, and slender chance for the victims of climate chaos to overthrow the tyranny of the 1 percent. Disasters like Hurricane Sandy make us realize that we are victims of modernity’s technological accomplishments, but we find ourselves unable to halt the headlong rush toward disaster that our cities catalyze. Theorists of disaster have come up with various ways of making sense of this condition. Writing of Americans’ reactions during the Cold War to the possibility of total annihilation in nuclear warfare, the psychiatrist Robert J. Lifton describes a condition of psychic numbing into which people retreat when confronted with the threat of extinction, a psychological state of disavowal that helps make sense of contemporary reactions to a future of anthropogenic climate disruption. Building on this analysis, sociologist Kari Marie Norgaard has written of the social organization of denial that takes place in affluent countries such as Norway and the United States, where the majority of the population not only are not yet adversely affected by climate change but may be said to benefit from the continuing consumption of fossil fuels that imperils not just the future but increasingly wide portions of the planet at present. Similarly, the critical theorist and professional provocateur Slavoj Žižek argues that our responses to looming Armageddon are shaped by forms of collective denial, despair, and withdrawal. Both pop culture and everyday life have become saturated by what might be called “catastrophic affect” — a visceral feeling that we are not just headed toward civilizational collapse but are already in the midst of it. The result has been a fascination with apocalypse, sometimes related to the overarching crisis of climate change, and sometimes of a more imaginative variety: ubiquitous zombies, global pandemics, tidal waves, flash freezes, famines. These provide people with an experience of climate catharsis, an ability to live out fearful fantasies of apocalyptic environmental and social breakdown, while also being soothed by what frequently double as thinly disguised settler-colonial jeremiads where strong white male protagonists lead a rag-tag group of survivors as they seek to reconstruct a purged social order. Contrasting with these sensational and utterly reactionary stories, photographers such as Subhankar Banerjee create ghostly aerial images of the shifting migration routes taken by caribou in the Arctic National Wildlife Refuge as the tundra melts under them, while James Balog documents the hasty retreat of the globe’s glaciers in sublime but unnerving time-lapse images. Yet all create images that challenge any notion that history progresses linearly, suggesting instead a present and future that is fragmented, incoherent, punctuated by disaster and, increasingly, apocalyptic. Parenti tells us that Ekaru Loruman had three wives and eight children. He does not explain what happened to these women and children after Loruman’s death. Perhaps they struggled to keep Loruman’s remaining cattle alive in the face of hostile environmental and social conditions. Certainly they would have turned to fellow tribesmen and women for help, but given the conditions described by Parenti it seems unlikely that they would find easy sanctuary in a stable family of kinsmen and women. Perhaps Loruman’s wives and children would eventually have followed the footsteps of the millions driven off the land every year around the world. Abandoning Loruman’s bitterly contested and arid land, his wives and children might have sought refuge in a nearby town or city. There they would have expected to find higher standards of living and more peaceful existence, but they would also face yet another convergence, equally fearsome as the one Parenti described, a conjuncture with even greater significance for the future of humanity and life on Earth in general: the collision of an urbanizing humanity and the increasingly extreme forms of weather unleashed by climate change. Two great tides are converging on the world’s cities, generating an unprecedented urban climax. The first of these is a human tide. In 2007, humanity became a predominantly city-dwelling species. Of the approximately 7 billion humans current living, 3.3 billion live in cities. But if the human condition is now an urban one, this urban humanity is not spread evenly across the world’s cities. Although urbanists in the global North often regard urbanization through the lens of city-building processes in Europe and North America over the last two centuries, most of today’s urban population lives in the developing world, where the vast majority of urban population growth will take place. These city-dwellers are to a significant extent refugees from policies of agricultural deregulation and financial liberalization. Enforced by tools of the developed world’s financial hegemony such as the World Bank and the International Monetary Fund, these policies of economic austerity pushed millions of peasants off the land and into slums in the rapidly growing but largely deindustrialized urban conglomerations of the global South during the last half-century. This bitter harvest of the worldwide agrarian crisis has been one of the largest transformations in human history. The neoliberal world order has essentially been a machine generating forms of extreme urbanization rooted in inequality. In the cities of the global South, one third to a half of the urban population lives in informal settlements. Residents of these unplanned zones face highly difficult conditions in their struggle to survive. As Mike Davis puts it, “Instead of cities of light soaring toward heaven, much of the twenty-first century urban world squats in squalor, surrounded by pollution, excrement, and decay.” Davis has been criticized for the hyperbolic tenor of his description of the neoliberal “planet of slums,” and somewhat unjustly has been charged with ignoring the everyday forms of human solidarity that knit together even the poorest informal settlements. Nonetheless, his account captures the radical challenges occasioned by this fundamental transformation in the human condition (even if he fails to discuss climate change at length). The hazardous nature of what Davis calls slum ecology is a key element of contemporary urbanization. The only land available to the poor tends to be located in the most disaster-prone precincts of cities, on terrain that has not been developed because of the natural perils — from landslides to floods — that make it unsuitable for elite habitation. Often urban squatters live in the midst of toxic landfills or industrial waste dumps, on the verges of railways and electricity lines, or in low-lying, floodprone land. Their vulnerability to environmental disasters is an extension of the harsh social calculus that drives them to live in dangerous sites. In addition, simply by living in these places, the poor generate conditions that threaten their own lives, including what Davis calls an “excremental surplus.” Since few slums have functional sanitary infrastructure, illnesses related to water supply, waste disposal, and garbage kill thousands of people around the world every day. This lack of infrastructure is, in many cases, a legacy of colonialism, when European settlers viewed the colonized as inherently unworthy of living in cities, and consequently systematically denied the amenities of modernity to urban neighborhoods where the indigenous lived. The wretched legacy of this colonial infrastructural has been intensified rather than ameliorated in recent decades by the moves of international financial institutions such as the World Bank to privatize sewage systems and water treatment plants in the cities of the global South. Exacerbating this hazardous slum ecology, the vast majority of the world’s city dwellers lie directly in the path of increasingly extreme forms of weather. Exiled by austerity, concomitant civil conflicts, and climatic turbulence into the world’s megacities, an increasingly large proportion of humanity finds itself especially vulnerable to the second great transforming force of our age: anthropogenic climate disruption. Close to 70 percent of the world’s population today lives in droughtprone areas; in cities, the heat-island effect can intensify the impact of heat waves and bring deadly infectious diseases such as meningitis, malaria, dengue, and the West Nile Virus. In addition, nearly two thirds of the world’s cities with more than 5 million inhabitants are partially located in low-elevation coastal zones, where they are subject to ever more frequent and intense cyclones and coastal storms catalyzed by climate change. Close to 2 billion people, 38 percent of humanity, currently live in densely populated coastal areas that are highly prone to devastating floods. Tropical storms and cyclones currently affect 1.4 billion people each year, 24 percent of the world’s contemporary urbanized population. The number of people exposed to cyclones alone is projected to more than double to 680 million by 2050. The areas most prone to such disasters extend in a band across the planet’s tropics, including urban regions in Central America, the Caribbean, the Bay of Bengal, China, and the Philippines. In this urban “tropics of chaos,” the calamities that befall slum dwellers must be seen not as “natural” disasters, but as anthropogenic climate disruptions in which uneven development and social inequality play a key role. But the catastrophic climax is not unfolding in the global South alone. The threat posed by climate change to wealthy nations is real, present, and escalating. Perhaps the starkest warning of the mayhem to come was the European heat wave of 2003, which killed an estimated 70,000 European city-dwellers, a figure that dwarfs the 1,800 deaths from Hurricane Katrina in New Orleans. In addition, rising sea levels will affect many of the world’s powerful global cities, the key command-and-control nodes of the global capitalist economy. Most of these metropoles happen to be port cities, a fact largely ignored in the literature on the global city. The United States for example has eight key global cities: New York, Los Angeles, Chicago, Boston, San Francisco-Oakland, Washington, DC, Miami, and Philadelphia, all lying in coastal zones. (Chicago is located on the inland coast of Lake Michigan.) Rising sea levels and intensifying storms threaten almost all of them. In global terms, the top ten cities whose populations are exposed to natural disasters today are almost evenly split between developed and developing countries: Mumbai, Guangzhou, Shanghai, Miami, Ho Chi Minh City, Kolkata, Greater New York, Osaka-Kobe, Alexandria, and New Orleans. In terms of imperiled economic assets, however, the list tilts heavily toward the developed world, with Miami, Greater New York, New Orleans, Osaka-Kobe, Tokyo, Amsterdam, Rotterdam, Nagoya, Tampa-St. Petersburg, and Virginia Beach topping the list. Although these cities contain 60 percent of threatened economic assets, they are located in only four countries: the United States, Japan, the Netherlands, and China. Each of these cities is a key node in global circuits of transportation and exchange. There will be extremely grave ramifications for the global economy if any of them are seriously damaged by the storms to come. It is projected that the threat to these cities’ wealth will multiply tenfold by 2070, while the total population exposed to natural disasters could triple to around 150 million people. These statistics highlight the fact that vulnerability to extreme weather is not simply a result of the exposure of masses of people to hurricanes, cyclones, and droughts, but a product of the complex interplay of populations, infrastructures, economic and political institutions, and anthropogenic climate change. Coastal cities face a future of ongoing systemic crisis as a result of climate change. These crises are likely to unfold as a slow cascade of rising mortality rates punctuated by spectacular disasters. As population numbers soar in these cities, increasing numbers of people are likely to be abandoned to their own devices, left exposed by the nonexistent or fraying infrastructures that buffer people from disasters. Compounding the threat of rising sea levels, the land on which most coastal cities are built is simultaneously sinking in a process known as subsidence. This process was directly responsible for the devastating impact of Hurricane Katrina on New Orleans, but it is a process unfolding around the world in fast-urbanizing river deltas, including the Po delta in Italy, Egypt’s Nile delta, the Ganges-Brahmaputra in India and Bangladesh, Vietnam’s Mekong, and China’s Yellow River delta. More than 500 million people currently live in the world’s river deltas, incredibly rich but ecologically sensitive regions that are subsiding at an alarming rate of 10 centimeters or so a year, causing the sea to swallow up dozens of meters of land in these regions each year. Over the past decade, 85 percent of the world’s major river deltas experienced flooding, killing hundreds of thousands of people. In tandem with this process of subsidence, coastal erosion is destroying the natural barriers that protect deltaic cities from increasingly severe storms and their surge waters. As mountain glaciers melt, hundreds of trillions of gallons of meltwater rush into surrounding seas that are themselves warming and, consequently, growing in volume. This convergence means that increasing numbers of the world’s coastal cities will soon fall below sea level, and will be exposed to the increasingly severe storms and surges born of an overheated planet. While residents of coastal cities around the world will face increasingly extreme conditions in the coming years and decades, it is the poor who are the most vulnerable to cascading climate disruptions in cities. In the cities of the global South, already life-threatening conditions in informal settlements are being exacerbated by climate change. When disasters do not directly take people’s lives by collapsing hastily fabricated buildings and unstable land, the lack of storm drainage and solid-waste disposal can magnify the impact of floods. Infectious diseases can be rapidly transmitted through floodwaters, leading to outbreaks of cholera, typhoid, leptospirosis, and meningitis that destroy the lives of the poor even after the floodwaters recede. Increasingly fragile, global-spanning food supplies are disrupted. For people living in informal settlements, infrastructure is a constantly improvised and negotiated collective achievement rather than an invisible and taken-for-granted aspect of urban life. As a consequence, everyday hazards can often turn into disasters for the urban poor in the global South. But when extreme weather events cause infrastructure to break down, vulnerable denizens of even the world’s most wealthy cities can find their lives imperiled, as the hurricanes in New Orleans and New York and the heat waves in Chicago and Europe demonstrated. In such circumstances, the catastrophic climax of urbanization and climate change affects vulnerable people such as the elderly and the poor above all, but it also threatens massive amounts of capitalist assets. Why, given these dramatic present-day and future threats, is there not more public alarm? On 30 July 2012, sweltering heat in India’s capital city New Delhi led to record power use, as people set electrical pumps to work drawing water from wells and the affluent cranked up their air conditioners. In tandem, farmers in the northern states of Punjab and Haryana, struggling to keep their crops growing in the face of a delayed monsoon season, drew increased power from the grid to run pumps irrigating paddy fields. The failure of the monsoon rains to arrive ironically also meant that hydropower plants were generating less electricity. While Indian citizens are used to rolling blackouts, the cascading collapse that knocked power out in most of northern India that day set records. Over 300 million people were without electricity. Phones and traffic signals stopped working. Railways were shut down for hours, trapping many people in the middle of their morning commute. Many hospitals had to suspend operations. Water supplies broke down as treatment plants and pumping stations stopped functioning. It became impossible to draw water from wells powered with electrical pumps. Although power was restored relatively quickly, the following day, 31 July, an even broader power outage knocked out power for 620 million people. India faces unique challenges relating to its electrical infrastructure: an estimated 27 percent of energy generated is lost in transmission or stolen, according to India’s Central Electricity Authority, and 25 percent of the country’s population, about 300 million people, have no access to electricity at all. But lest the denizens of developed countries feel smug about power failures in the developing world, it’s worth recalling that the northeastern United States suffered a similar cascading power outage during the summer of 2003, an event that shut off electricity for 55 million people in the midst of an intense summer heat wave. Subways in New York stopped running. Air conditioners no longer worked. Water stopped flowing out of faucets. Hundreds of thousands of people had to walk back to their homes in the outer boroughs in the blistering sun.